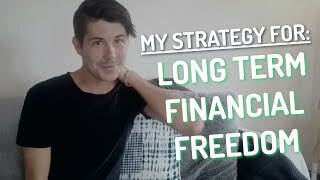 Last week I got real and raw and talked about how I got into debt, now I’m looking forward and sharing exactly how I plan to achieve long term financial freedom. So last week I got pretty vulnerable with you and talk to about the myriad of things that caused me to find myself in the current situation that I’m in, where I’m in debt. So we looked into the past and now we’re going to look into the future towards the plan that I have, the how I plan to achieve longterm financial freedom. And the goal here is that I’ll take you on the journey with me so you can see as this adapts and changes as time goes on and whether or not I actually achieve this and get out of debt and go on to achieve the financial freedom. So what is the strategy in a nutshell? Well, something that’s really interesting about my circumstance that’s probably different from most people is that yes, I run my own business so I don’t have a job. But the income that I earned from my business is still, the majority of the income is still passive income. So it’s income that I’m not working for. And so while I no longer consider myself financially free, as in a business doesn’t generate enough passive income in order to pay my expenses. So I need to work the work that I do actually generate more passive income. So the work that I’m currently doing to grow my business is actually growing the passive income of my business. So what that means is that in a period of six to 12 months, not only will I be paying off debt, but I’ll also be growing my passive income to the point where ideally in six to 12 months time, maybe 12 to 24 months time, I will achieve that pseudo financial freedom again. So I’ll be effectively financially free through my businesses and they’ll generate me enough income that I won’t need to work anymore. Now, the decision that I made in the past when I was 28 and this happened in the past, was that I would stop working and then I would try and find what made me happy in life because I was very disillusioned achieving financial freedom and I didn’t know what motivated me to work. And I find I’m there in a very different situation. Now I work because I need to work. Yes. But I also know so much more about my internal motivations and what makes me happy. And so I know that when I achieve financial freedom, financial freedom is no longer the goal. Even longterm financial freedom is no longer the goal. The goal is to be present in my life and to enjoy the work that I do, enjoy the people in my life, enjoying my kids and my family. And that’s what I do. And so my internal motivation is for consistent growth and consistent learning and that just tends to outwork itself through my business. So in that way I’m a little bit unique because I will likely have achieved financial freedom again by probably 32 or 33 but I’m not going to stop there. So the plan for me to achieve longterm financial freedom is to step one, build up my businesses. That is the primary at the moment. So all the other goals, like pay off debt and invest in property will come as a result of focusing on growing my business. Now my business isn’t just on property, on property forms of part of it, but I have a network of niche websites where I create content for and I manage. So I’ve got a network of websites and network of businesses that I’m focusing on growing. And that is my primarily goal and primary objective. And I guess it’s the same with everyday people. Their primary goal is to work and to earn enough money to get by. For me it’s about working to grow the income from my business. Now when it comes to more logically achieving that longterm financial freedom, I don’t see the business as a way to achieve longterm financial freedom because businesses need to be managed. Even that passive income that I get from my businesses does fluctuate over time. So market trends change online, things that used to work may not work anymore. So business does fluctuate with that and does need some level of management in order to keep going. So I don’t see that as a solution to longterm financial freedom. So focus will be on growing the business and then step one will be paying off debt. So, as I mentioned in last week’s video, which I will link up down below, I got myself into some debt and now focusing on paying that off. I actually did a video on how I plan to pay off the debt. So I’ll link that up below as well. If you want to go down the rabbit hole and watch me talk about that. So first step is to pay off debt and to get myself in a position where I no longer have bad debt in my life. So no longer have credit card debt, no longer have any personal loans, no longer have any money that I owe the tax man or anything like that. I want to get completely out of debt. So at the moment I am living at my dad’s. My Mom’s going away for a month, a bit over a month, so I will be using her place. And so basically I am saving money and reducing the costs in my life in order to pay off that debt, rent being one of those major expenses. I’m also focusing on living frugally within my life. So, not spending excessively of like I used to. I am much more conservative with my finances and yes, a lot of you out there know that I love my coffee and that I do buy coffees slightly more than occasionally, but even that is a manageable fee that I’ve probably spent maybe $30 per week on coffee. So it’s not crazy excessive amount. I don’t think so. Other people who don’t love coffee, you’re probably like Brian, you crazy. $30 per week is a hundred. I don’t know. It’s a lot. Okay. What is it? It’s like $1,500 per year. Okay. Saying that, yes, that is excessive. I need to fix that. Okay. Stay tuned. Coffee fix solution. Um, coming up. So all right. 1500 a year. Yeah, that’s too much to spend on coffee. Definitely too much. Especially seeing as I can make good coffee at home. But, uh, okay. Apart from the coffee in my life, I do live quite conservatively now. So the things that I spend, I don’t spend a lot of money on a of, I have a very small car that doesn’t require much petrol. The clothes that I wear. This tee shirt is $20 I have four of them. Okay. I wear the same pair of jeans, which I then turned into shorts. I live quite conservatively. The bulk of my money that I spend per week goes on my kids when it comes to things like clothing for them, food for them, schooling for them, that sort of stuff. So otherwise I have really reduced my expenses in my life. So once I’ve paid off debt, the strategy for longterm financial freedom will be through investing in property using the two properties to financial freedom strategy. So again, the bulk of my focus will be on building up my business and growing my income that way. After I paid off debt, then I’ll be saving a deposit in order to invest in property are likely look at property in Brisbane or on the sunshine coast with the goal of purchasing a property that I can then build a granny flat on. So purchase the property and then build a granny flat on it, which will make the property cash flow neutral or cashflow positive. It means that that property will then go on to pay itself off. So basically once I purchased the property or then build the granny flat and then I’ll take that and just kind of pull it to the side and just kind of let it do its thing. So there’s obviously a little bit of management when it comes to owning property and dealing with that. But basically that property will see it as its own little entity paying itself off. So any extra cash flow that is generated from that property will go back into that property. So to go back into a buffer fund for that property, it would go back into an offset account for that property. It would go back into paying off that property. So basically that property will be a self contained entity that will fully take care of itself. So I won’t be putting money into it in the beginning. I won’t be taking money out of it either. It’s just going to sit there and the goal of that property is to be a good little property and to pay itself off as quickly as possible. So the rental income’s going to come in. That’s going to pay the principal and interest on the mortgage as well as any extra money. We’ll then go towards paying off that property faster or building up a buffer fund for that property or potentially building up a deposit for future properties to invest in. So once I purchased that first property, then my focus again, we’ll shift to purchasing another property. So that will be saving a deposit, maybe leveraging equity from the first one or leveraging cashflow from the first one and savings in order to purchase the second one. But then it’s basically rinse and repeat. So the purchase the second one, build a granny flat on that and then that becomes a self contained entity, which I moved to the side and that’s going to pay itself off. How many times I repeat that, I’m not sure. I definitely want to do it at least two times. Ideally probably more than two times. But that is the strategy for longterm financial freedom is that those properties will then pay themselves off. I guess what I will do is continue that process of buying properties, the building granny flats, self contained entity until I reach a lending limit where I can no longer feasibly do that anymore. And so once I reached that lending limit, then I’ll move into stage number two of the property investment journey. And that is focusing on paying off debt. So let’s take all these self contained banquet entities over here. So we’ve got our properties here. Rumor, this whole time, still focusing on growing my business, building out my business, keeping my business running. Now that I’ve got these properties that are self contained entities that spinning off positive cash flow, the goal then is to take extra income from my business to pay down debt on those properties. And the strategy that I think our use is that I will focus on paying off one property first and paying it off completely and then focus on the next one. So basically pay off one property first. Once it’s completely paid off, then I had the decision, do I now take this income from the property because they’re not paying mortgage anymore? And do I start to live off this income or put it into my lifestyle or do I continue to take this income to pay off debt on my other properties faster? And not exactly sure how that’s going to go and how that is going to pan out in the future. But that I guess is the goal. So step number one, build up my income. Step number two, pay off debt. Step number three, investment properties that are self contained entities that will go on to paying themselves off anyway. And then step number four is once I reach a lending limit, then I’ll go ahead and focus on paying off those properties as quickly as possible. And then once those properties are paid off, that will be my long term financial freedom. So the goal, I guess, is to build up those foundational properties as quickly as possible. And then I’ll feel like I’ve set myself up for financial freedom even though I won’t have it. So I’ll have pseudo financial freedom through the business. I’ll have my long term financial freedom through the properties and then it’s just about bridging that gap and changing it from pseudo financial freedom and bringing, paying off those properties as quickly as possible. It’s that I have real longterm financial freedom and so that’s my goal. That’s my strategy for achieving financial freedom. It’s a very simple strategy, but when it comes to investing in the properties, it’s about buying high quality properties in metro markets that are going to have long term demand, longterm capital growth. Capital growth is not the primary goal. The long term demand and the cashflow is the primary goal of those properties, but if I can get capital growth as well, then obviously that is definitely beneficial. But yeah, that is my strategy for achieving financial freedom. Do you have a strategy? Do you know how you’re going to achieve longterm financial freedom? The thing that I love about my strategy is that I’m going to have pseudo financial freedom through the business anyway, so if I decide I want to stop working, technically I could. I don’t think I will. And then also once I purchased the properties, I now have longterm financial security and because they’re self contained equities that self contained entities that don’t need it, my input, they’ll go on to achieve my longterm financial freedom. So then I don’t really have to focus about that focus on that anymore. I can just focus on living my life and enjoying my business and enjoying my life as well. So do you have a strategy for how you’re going to achieve long term financial freedom? If you don’t and you need help, then Ben and the team over at pumped on property do offer free property strategy session. So if you want to get clear on where you’re at now, where you want to be, how to bridge that gap and how to successfully invest in property and achieve your goals, then over on property.com.eu you can learn more about them and what they do. Learn more about that strategy session strategy is so vital and so important. So yeah, hell over on property.com Donahue to learn more about that so you can get clear on your strategy moving forward. And why here? Why not? Go ahead and check out the video that I did on how I got into debt as well as the video on how I’m paying off my debt linked to be in the description down below. Until next time, stay positive. Australian Property Market Update: March 2019	What is a Buyer’s Agent and Should You Hire One?